More than 2,700 Redlands-related objects have been donated to A.K.Smiley Public Library since the Redlands Historical Museum Association began in 2002. Staff and volunteers catalog them in the Heritage Room using the professional PastPerfect database. Computerization makes it simple to search for and pull up any donated item, to see a photo and complete physical description and donor information. At one point, storage space was a problem, until the City of Redlands made available a small house equipped with a security system. The $7,000 in steel shelving filling three rooms was constructed and provided by the Museum Association. Historical items have ranged from the very small --- a Redlands High School pin from the 1920s --- to the very large --- Bob Break's 1927 International grove truck, complete with a load of field boxes ready to go out to the groves to be filled. Items donated must be Redlands-area-related, including possessions of historical Redlands families, artwork related to artists living or painting in the Redlands area over the years, and photos, paper ephemera, and objects depicting the history of Redlands. The deciding factor is: "Will the item help tell the history of Redlands?" Shown here are a few of the many items donated. 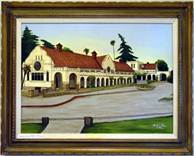 More than 100 original oil paintings of local buildings by the late artist Hazel E. Olson were donated to the Redlands Historical Museum in 2003. Included also is a series of California train stations and a complete set of the California Missions. This painting depicts A.K. Smiley Public Library as it looked from 1939-1999. This teapot is among several silver pieces monogrammed with the letter "D" which were donated to the museum by a descendant of Davis Donald, a member of the Donald family, well-known for building much of early Redlands. 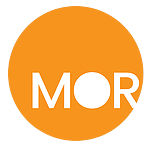 Photographs (in many forms, from glossy prints, to negatives, to scrapbooks and glass lantern slides), particularly with good documentation of names and place, are a major interest for the museum collection. 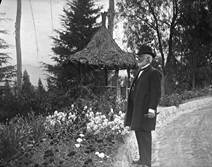 Here is Albert Smiley and a California version of the Mohonk Mountain House summer house in Canon Crest Park --- a glass slide brought back from Mohonk, N.Y., by Library Director Larry Burgess. Architectural artist Karen Mahmoudi shows a few of her annual sketch books (including more than 3,000 sketches and finished pen and ink drawings) completed for real estate agencies and for Y Home Tour and Camellia Luncheon brochures -- all donated to the museum when she moved to Santa Monica. Bill Junkin, left, of Smith Jewelers donates the National cash register used for many years in that shop on East State Street (Nathan Gonzales accepting for the museum). Redlands has had many banks and many bank name changes over 125years. Three , including Redlands National Bank, had the right to issue US national bank notes in the early 20th century. Diana Holmes looks over the dozens of Wesley Trippett pottery shards dug up by her late husband Vern on their Trippett-home property on Summit Avenue. Next to it is a photo of a complete piece acquired by the Library. Brochure advertising plaster of Paris letters from the Mitten Company, in this case the "Show Boat" font with matching white letters. Second-place horse trophy for the Redlands Mounted Police 1947 Western Trail event, donated by the Yucaipa Historical Society. Several watercolor paintings by Jean Cranmer, donated by the Kimberly Crest, including her oil-on-canvas self-portrait. 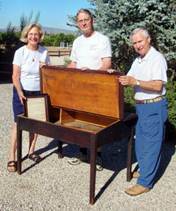 1870 schoolmaster's desk owned by Charles Russell Paine, second San Bernardino County superintendent of schools, donated by his great-granddaughter Cornelia Grant (shown with husband Halcott Grant and RHMA recording secretary Ron Kibby). "GEO. GARDNER REDLANDS CALIF" heavy steel print block in reverse letters with handle on the back, used by the contractor to imprint his cement work. Quilts include the replica of the city logo, two quilts of Redlands homes blocks, the Contemporary Club Redlands Centennial Quilt, and the Redlands citrus labels quilt made by Redlands Area Historical Society volunteers and donated by Suzanne and Jeff Owens. This 1906 cast-iron folding chair has the AME initials from St. Paul's African Methodist Episcopal Church, corner of Sixth and High streets, now the Living Word Fellowship. Curtiss Allen Sr. donated a 1902 map of Redlands which he found in the rafters as a former owner of the Victorian-era Morey House. Here RHMA members inspect the map at the October 2011 meeting. The museum collection includes many small advertising items such as this matchbook of the former Griswold's restaurant, now the location of L.A. Fitness. World War II officers cap worn by Meridith Beaver, founder of the Beaver Medical Clinic. A.K. 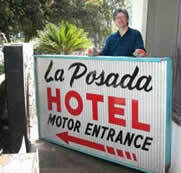 Smiley Library Heritage Room archivist Don McCue displays one of the original La Posada Hotel signs. These horse tie-up rings were rescued when the City of Redlands put in new curbing on Fifth Street across from the Tartan Restaurant. The yardstick showing their size is one of some 60 in the collection advertising Redlands businesses. Left, the 24-inch wall clock used by Charles Figgins, head telegrapher at the Santa Fe Depot. Right, ornate Victorian shelf clock from the old Redlands Daily Facts office building. Porcelain Redlands souvenirs showing A.K. Smiley Public Library on the sugar bowl and Smiley Heights on the shoe. These early 4-by-4 Redlands street posts showing Division, Garden Hill, San Mateo and New York streets have been replaced by colorful metal signs decorated with citrus. Jamie Miller saved lots of items for the museum from her Charles M. Brown Jr. family. 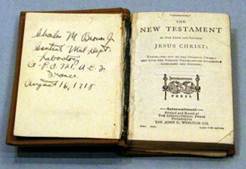 Shown here is this long-time citrus grower's four-inch cloth-covered pocket Bible, inscribed "Milton from Grandma, Jan. 1, 1918" and an August inscription with his AEG address in France just before the war ended. Enameled signs marked the growers groves and packing label. Dollhouse of a Victorian home on Citrus Avenue east of Crafton Avenue. Sunkist forks and wooden display box. 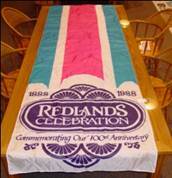 A City of Redlands Centennial banner from 1988.